The Special: Special price for the electronic course is $89. After this introductory offer, the price will be $149. This three hour course allows you to download the PowerPoint with audio and videos, the evaluation, and the manual -- exclusively online so you don't have to leave the house. Delivery is through Drop Box. Take the course as you have time. Upon completion of the evaluation, you will be emailed a Certificate of Completion eligible for 3 CEC's from ATRI and AEA. Description: RAST focuses on Safety and Liability Protocols and in-pool assists. This course is important because the therapist/practitioner has the primary responsibility for understanding liability issues, providing a safe environment to protect patients/clients from injury, and assisting when emergencies happen. The Aquatic Exercise Program for Wounded Warriors and Injured Athletes is the program used by the Army and the Marine Corps and now available to community and/or therapy facilities. 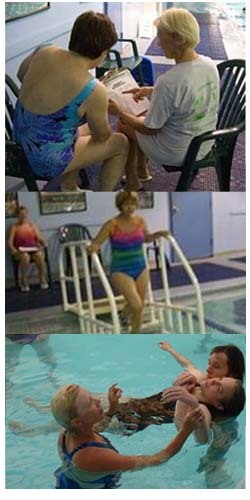 The program provides a way to accelerate the return to regular activity without potentially detrimental outcomes, and is appropriate for anyone who has been injured or participants looking for additional challenges in their aquatic exercise. Deep Water Interval Cadence Training is an important component of the Aquatic Programs for Injured Warriors and Athletes. It provides a non-impact exercise option to maintain cardiovascular endurance of sufficient intensity and duration to improve fitness. It includes an Introduction and Review of Basics, Heart Rate Monitors, Flotation Belts, Tethers/Hitches, and Practice Sets. This DVD provides step by step instruction in leading and practicing Deep Water Interval Cadence. This DVD contains Upper Extremity and Lower Extremity exercises with drag equipment along with Passive Stretching. These are important components of the Aquatic Programs for Injured Warriors and Athletes Program. The series of strength exercises can be adapted to buoyant equipment. 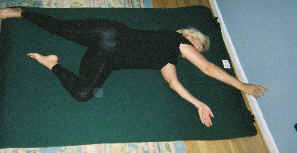 The passive stretching exercises are based on military land stretches. Step by step instruction is provided in leading and practicing strength and stretching exercises. The Aquatic Programs for Injured Warriors and Athletes Manual, 2 DVD combo (Deep Water Interval Cadence Training and Aquatic Exercises), plus Instructional power point DVD used as an Instructor’s Manual to train staff is available as a set. 8 hour course focusing on standards, Federal regulations, health codes, enforcement, safety of practitioner, emergency action plan writing, developing policies and procedures, and practicing basic water assistance skills. The Purpose is to give the above groups the necessary tools to work in the safest environment. This is the renewal course for RAST and is valid for 3 years. CD provides an overview of Risk Awareness and Safety Training (RAST) and Risk Awareness in Therapy Situations (RATS) focuses on the importance of maintaining current certifications, recognizing emergencies and precursors to emergency situations and being able to respond appropriately, recognizing signs of physiologic stress demanding immediate attention, communicable disease transmission, and first aid for deck and locker room accidents based on OSHA and CDC information and guidelines. 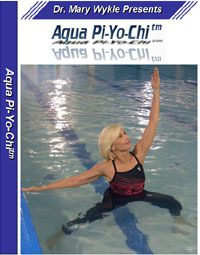 By - Mary O. Wykle, Ph.D. A complete step by step guide for moving Yoga, Ai Chi, and Pilates suspended into the pool. It is an excellent resource manual for anyone interested in Yoga and Pilates. Includes 21 yoga poses and 11 different Pilates exercises. Each pose and movement is explained and demonstrated on land and in the water with modifications and adaptations for all populations. Excellent for breath work, balance training, core strengthening, and mindfulness/meditation. Learn how to create transitional flow with Ai Chi like movements and incorporate noodles into the Yoga and Pilates exercises. 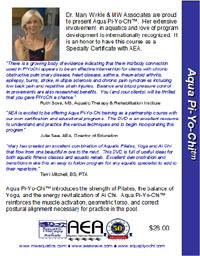 This is the official course manual for the Aqua-Pi-Yo-Chi specialty certificate program and includes photos of all exercises, descriptions, modifications & contraindications on all movements." Aqua Pi-Yo-Chi™ includes the strength of Pilates, the balance of Yoga, and the energy revitalization of Ai Chi and enhances your breathing, strength, range of motion, alignment, and balance. Benefits are achieved through correct muscle initiation and use of the breath for movement while maintaining emphasis on the geometric box. Regular practice leads to improved balance and correct postural alignment, increased core strength, and personal calm. 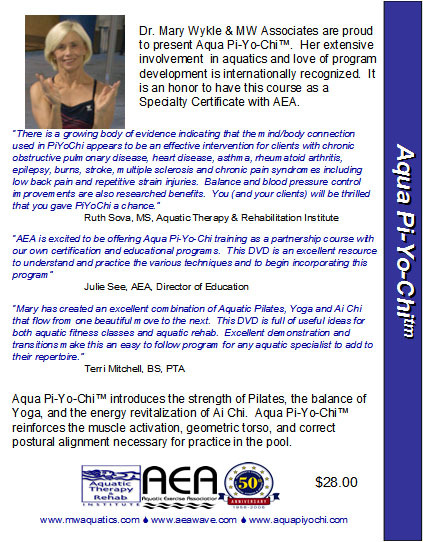 This DVD includes instructional segments on Pilates, Suspended Pilates, Yoga, Ai Chi, and how to combine into a flowing program. It is the perfect complement to the Aqua Pi-Yo-Chi course and the manual, Transitioning Yoga & Pilates Between Land and Water. A complete instructional guide to Pilates and Yoga in the water, and then Mary leading you through a routine. Fluid Yogalates combines the large muscle influence of Yoga, the isolated muscle initiation of Pilates, and the round, flowing movements of Ai Chi. They enhance your breathing, strength, range of motion, alignment, and balance as they flow together in the water. Grounding Ai Chi explores the never ending possibilities of practicing deep breathing and flowing movements in different environments and surroundings.